Turbine really took us by surprise with yesterday's announcement of Dungeons & Dragons Online: Menace of the Underdark. While we've always been aware of just how much potential the game has, we had pretty much given up on a full-on expansion pack ever since retailer listings for a "Forsaken Lands" add-on disappeared into obscurity years ago. But Menace of the Underdark changes that in a big way - not only will it be the first time we've ventured to the Forgotten Realms in the MMO space, but it'll mark the first time we've explored the Drow underworld in a video game setting since BioWare took us there in Baldur's Gate II: Shadows of Amn and Neverwinter Nights: Hordes of the Underdark. On top of that, MotU is the first title in the history of D&D video games to offer a crossover between multiple campaign settings. GB: How long have you been chatting with Wizards of the Coast about the idea of taking the game into the Forgotten Realms? Fernando: That's been going on for a good while. None of these things have happened really fast. We've been live with the free-to-play model from September 2009 so if you think back that far. We're now coming up on 2½ years into this model sometime this quarter. So we probably started talking about this with them about six months after we went free-to-play where we really started seeing the success as something that was provable, that was going to keep growing the franchise, and then frankly had legs. That's right around the time that Turbine was firming up our plans to move The Lord of the Rings Online in the same direction because of the success of the free-to-play model. And well, it's been a long time coming. Really, it's not an easy thing to get this kind of thing approved through many different folks, Wizards of the Coast being one. When we started, Atari was in the mix, so they were part of the conversations even though more recently they're working directly with Wizards of the Coast because of the licensing deals that have changed on that side of things outside of Turbine's control. But, yeah, it's been something we've been talking about for a very long time. I think ultimately what really sealed the deal for us was last year when Rise of Isengard presales started going and when we very quickly got to see that Rise of Isengard was The Lord of the Ring Online's biggest expansion pack ever, best selling expansion pack of Turbine ever, and it was under the free-to-play model where frankly there was some question as to how does a free-to-play game release expansions and does that make sense and do players buy it? And so having that experience under our belt really helped to finally seal the deal here. And we've been working on it in active development for almost six months now with art and design documents. And now the full team is on the project. We've grown the team and we're in the thick of it building out a new world. It's very exciting. Eric: The concept of introducing Forgotten Realms into our game setting without having characters actually play a different game like a DDO 2 and have it interweave with our Eberron lore was something that only recently came into play with WotC giving direction about how we can merge the two worlds. And so we're establishing that story in our prequel, Update 13 releasing this year, and it will establish how the worlds blend. And then with the start of the expansion, we'll actually have a quest that you go through the whole journey to travel to the Forgotten Realms. GB: It'll be a little weird seeing a Warforged running around the King's Forest, won't it? Eric: That's right. That's right. Yeah, and with goggles nonetheless. Fernando: Yeah, there's definitely some of that, but that's been one of the great things about getting involved with Wizards of the Coast and really kind of poking at what's okay and what's not okay and what can fit into the realm of the rules and the storylines and then ultimately what's okay in the DDO version of the universe which doesn't exactly have to be the same thing that's happening in the source books with WotC. But, yeah, it's been a long time coming. We're very excited about the story we've created with the Forgotten Realms experts over at Wizards of the Coast and we think the players will really enjoy it as well. Obviously, at the end of the day it's about taking players on a great ride and on some fun adventures and we think the players won't be disappointed. GB: You said that Update 13 was going to introduce us to the method we'll use to reach the Forgotten Realms, but once everything is live and the expansion's been out for awhile, will it be possible for us to create characters directly in Eveningstar rather than starting out in Stormreach every time? Fernando: No, that's not something that's going to be available in the initial release. The expansion is focused on epic levels and the epic content primarily will be what players will find in the Forgotten Realms areas. But that said, we're taking steps to make sure that you don't have to wait until level 20 to start getting involved in the epic storyline. It will start at level 16 with the Update 13 free adventure pack, which is the prologue to the expansion pack story and the setup for how players will eventually get to Forgotten Realms. So you don't have to start at level 20 - you can begin more around level 15 - and will be able to get into those dungeons and start playing. We're also taking steps to make sure that players are able to get up into the higher levels a little bit faster, move through the early levels in the game, group with their friends, and get to these great stories that they want to play in Forgotten Realms. And of course there are going to be big features like the druid class which will be available to all players starting at level one and pretty big updates to the game systems. Like, notably, we're redoing our enhancements UI. That's going to improve the gameplay right at level one for everybody, whether they be free players, VIP players, or players who are playing the expansion pack. GB: Are you going to drop the Eberron Unlimited subtitle now that it's going to span two campaign settings? Eric: Yeah, starting early this year we're going to be Dungeons & Dragons Online. That's also something that we had taken some time and had a lot of discussions with WotC about how we represented that. 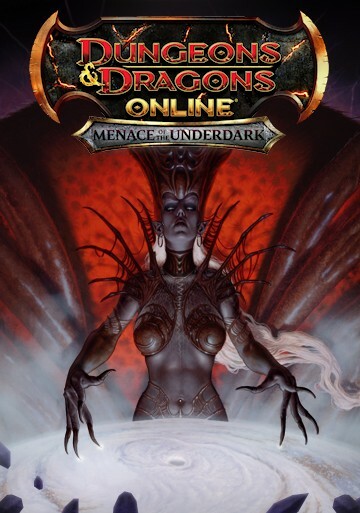 So we're officially going with Dungeons & Dragons Online as our primary title and then we'll add the subtitles when it's appropriate, for example, "Menace of the Underdark" for the expansion. Fernando: Yeah, that's kind of a big deal and it's almost buried news in all the big news that's happening here is that Turbine now has permission to be Dungeons & Dragons Online without having to have a subtitle attached to it. So that's the brand of our service, Dungeons & Dragons Online. We'll be including adventures in Eberron, and we'll include content like Menace of the Underdark. Conceivably, we can expand to other D&D universes and other parts of those existing settings over time. So, really, we're just the online experience of DDO in the MMO space right now.